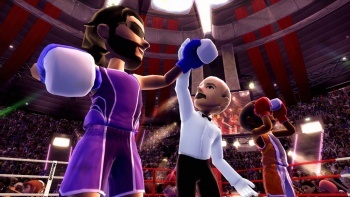 Sources close to Rare say there have been large cuts to its art department, and the future of the UK dev will rely on the success of Kinect Sports 2. Late last month, a post on 4Chan claimed the UK developer Rare was in trouble, and, "In an effort to cut costs, Rare has cut their last permanent members of art staff. All artists working there are temps." It also mentioned "Rare's fate is directly, totally, and unequivocally tied to the success of Kinect Sports 2." It being a post on 4Chan, all information contained therein was inherently (and rightfully) suspect. But more rumors, substantially more credible, are lending credence to the 4Chan post. According to Edge Magazine, two independent sources have confirmed Rare's entire art department has been informed of their redundancy (what the UK calls a layoff), and that about 23 of those artists will be moved into managerial positions. This appears to be an attempt at skirting a UK law that says any redundancies over 19 requires a full consultation process, seeming to imply Microsoft wants these layoffs to happen quickly and quietly. However, several artists were angry enough to take the redundancy packages offered for leaving, driving the number of layoffs higher. One of the sources did not know the exact number of people leaving but said "due to the consultation period coming in, it would seem to be more than 20." When asked for comment, a Microsoft spokesman said, "While redundancies are never easy, these organisational changes are part of Rare's ongoing strategy and operational planning which typically coincides with the shipment of a title," and mentioned "Whilst we're not discussing the exact numbers involved, I can assure you that it's far fewer than you've indicated and represents a small percentage of the total Rare team." While the sources have made no mention of any reliance on Kinect Sports 2 for Rare's existence, the 4Chan post appears to be startlingly accurate as it pertains to the art department. This could mean that Rare is in trouble, or some troll made a lucky guess. The shift to contractors in the art department, in itself, is not indicative of either option; it could just be a shift similar to one much of the games industry is making to the "Hollywood Model" of hiring contracted workers. Either way, today 4Chan was at least partially credible. I fear for the world.